I am now the proud owner of an in-line filter for my Enolmatic vacuum bottler. The Viognier is the first wine I bottled with it. 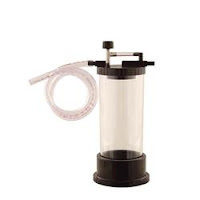 I used a membrane cartridge filter, which is a true sterile filter (0.2 microns). It took a bit of time to figure out how to use it properly, but once I got it going, it worked like a champ. The Viognier was made from a bucket of juice from California that I purchased at a local winemaking supply store. Now it is a amazing wine that is about 13% alcohol by volume. It has a very tropical aroma, and I can taste both pineapple and peach flavors. I think this wine is going to be really good in the coming months!